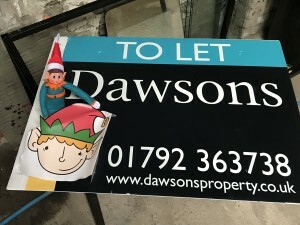 Throughout December we are posting a picture of the Dawsons Elfie on 50 Property Marketing Boards at homes all over the Swansea Area. We encourage you to stop, pop out your phone, and take a selfie with Elfie. 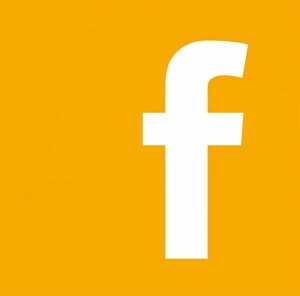 Then you just need to post it onto one of our Social Media platforms and during w/c 17th December we shall pic our favourite selfie, and the winner will receive a Dawsons Christmas Hamper of Goodies* in time for Christmas. As the sun rose on Saturday 1st December 2018, Elfie woke full of festive spirit. He stretched and took in the last sight of this room, today was his moving day and he was heading to a bigger and brighter place, you see. He was off to see the lights and wonder of a big city (not too big a city mind, as we must remember he is a very little elf!). Santa had promised young Elfie that if he was a good, helpful elf all year he would be able to spend this Christmas in Swansea! 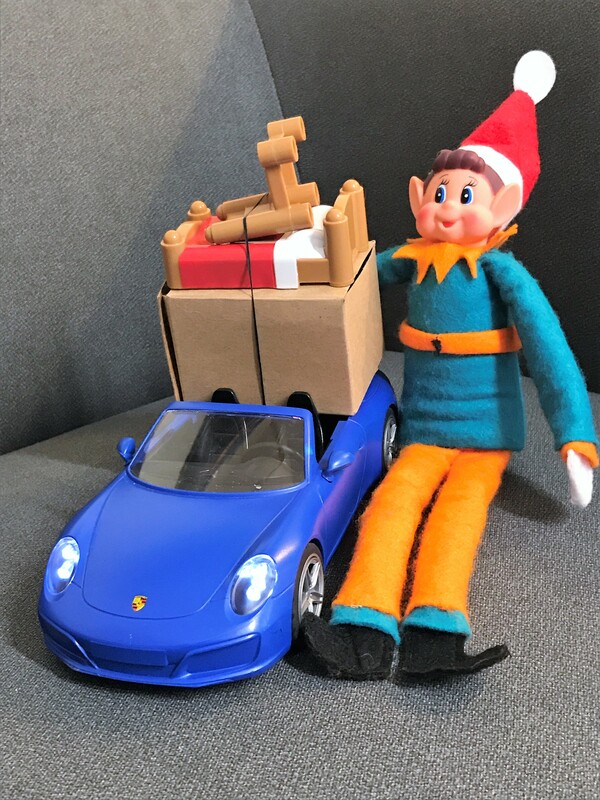 All Elfie had ever seen of the sea was on the back of toy boxes as he walked through the great toy warehouse, so Elfie was careful all year to make sure he behaved well and worked hard because he knew that Santa would always keep his promises to his elves. And Elfie so wanted to see the city! 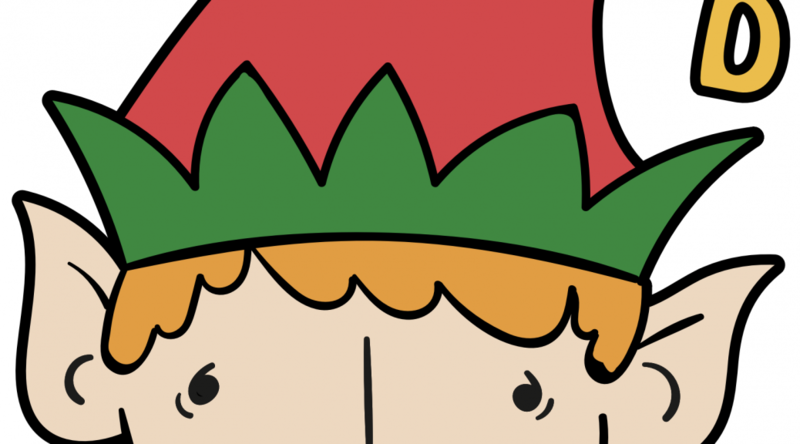 Although for the past eleven months Elfie had been good, he is actually one of the cheekiest elves you are ever likely to meet! He is the kind of elf that would point and laugh if you slipped on a banana peel. You would often find him playing practical jokes on his brothers and sisters before he was old enough to work with Santa… He found it hilarious to put a big hairy plastic spider in his sister’s soup one day, Elfette hasn’t eaten soup since! Though this may sound mean Elfie never meant to cause any harm, he wouldn’t want to upset anyone, being an elf he has a kind heart but he just loves a little bit of mischief. He would never like to be called an evil elf though, he isn’t that bad. Also, SANTA wouldn’t allow an evil elf in his workshops and warehouses and certainly never allow them to venture to Swansea! Day 1: With a spring in his step Elfie jumped out of bed and started to pack the last few bits and bobs ready for the big move. He tucked his sleeping bag into the car, slid into the drivers seat excitedly opening the directions to his new home. He looked at the address and it was as Santa promised….SWANSEA! Elfie put the radio on and sang his heart out to ‘We Wish You A Merry Christmas’, ‘Jingle Bells’ and many other songs all the way to his new home. 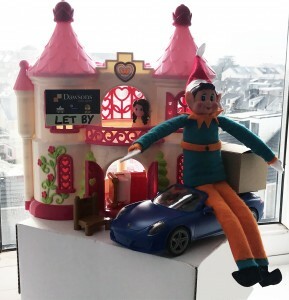 As Elfie pulled up outside his new house, he felt really lucky, Santa had fixed him up with a beautifully decorated home with a sea view for his stay in Swansea. Elfie looked up at the house and knew all his hard work had been worth it. 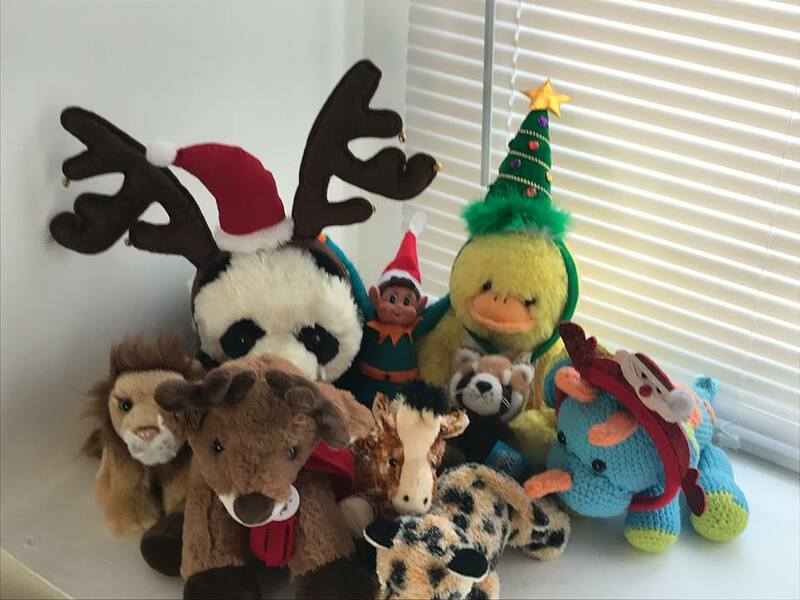 Elfie decided he was going to like it here and he set about unpacking his belongings, knowing all to well that this month was going to be the most exciting of Elfie’s life and he couldn’t wait to start! Elfie spent all of his first full day in his new home unpacking and looking out of the window at the wonderful view. As the sun went down Elfie shuffled off to bed, he did have one box left to unpack, but he knew this would wait until the morning. 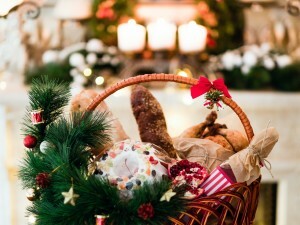 A little grin appeared across his face as he glanced at the box before curling up and getting some well earned sleep! Opening the final box was going to be fun, Elfie was so excited to get to the contents that he nearly fell over his own feet on his way to it, chuckling to himself, it would have been funny if anyone had fallen over their feet. Elfie gently opened the box and peeked inside, he reached in turning the item over in hands with a little glint in his eyes. 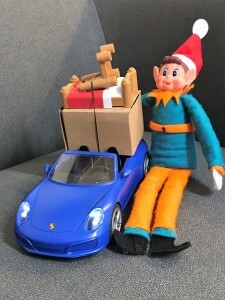 Elfie quickly put the item back into the box and put the box back into his car, Elfie set off to do something that some may consider naughty but Elfie just wanted to announce to Swansea that he was here. Elfie had decided that he was going to go and find some Estate Agents “boards” like the one that had been outside his new home, and he was going to leave a little happy picture of himself on a few of these as everyone will surely want to come and see the new Elf in town! 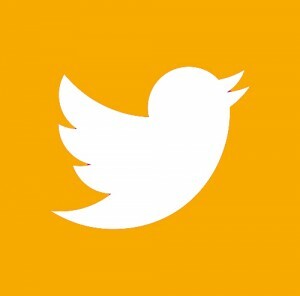 Elfie snuck from board to board putting his little picture on his favourites giggling to himself as he went…. Since running around all of Swansea yesterday, Elfie has decided to have a quiet day today, whilst looking through his move-in pack he came across a Dawson’s “Reward Card”… This little card can give Elfie discounts at local participating businesses. 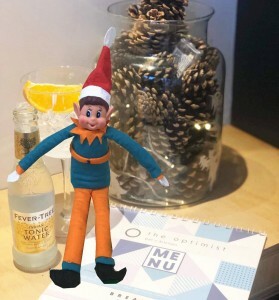 Elfie decides today is going to be a relaxing day and he heads to “The Optimist” cocktail bar in The Uplands, where he uses his Reward Card on a couple of drinks and some snacks. Watching the people walk by outside Elfie is content… . But what is he planning? He’s woken up surrounded by forest creatures and really wants to know how he got here and also how a panda got to Swansea? Answers on a postcard, please! 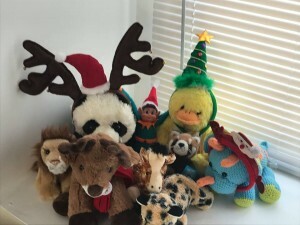 The walk home yesterday and the making of a few new furry friends (especially Rusty the naughty red panda) has inspired Elfie to return to his cheeky roots. As he passes through the office where his new home is located, Elfie tripped over a roll of Christmas wrapping paper and an idea popped into his head: He was going to find the most important looking doors and Christmas wrap them (the ones with the locks must be the important ones, right?). 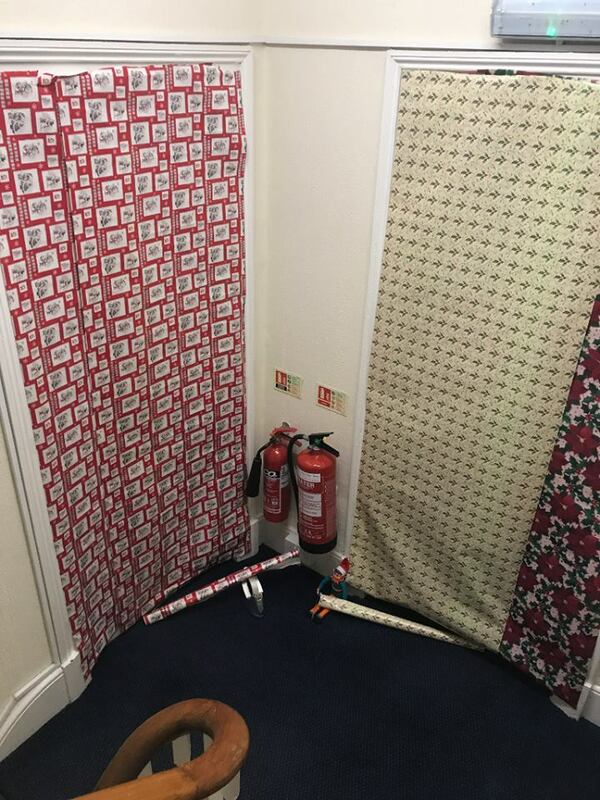 Elfie giggled to himself as he taped up the doors, gave a quick high-five to Rusty and a look back at his work… Elfie headed to bed. *Hamper in the competition photo is a stock image and contents of the hamper prize will be different (but still amazing)!